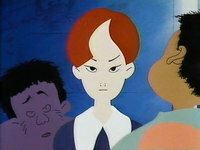 Plot Summary: A strange red-haired boy named Saburou Takada is a new student at a small countryside elementary school. A classmate named Kasuke nicknames the kid "Matasaburo of the Wind" due to a strong breeze that passed by the school when the youngsters first met him. Some of them notice that peculiar incidents happen around Matasaburo.